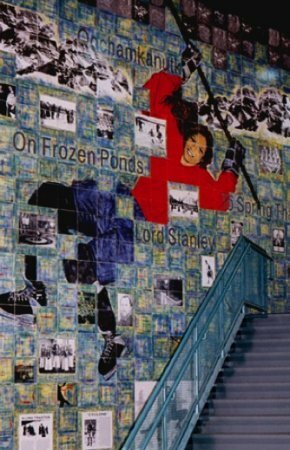 From Frozen Ponds is a collage-like mural filling an entire wall [alongside a staircase]. 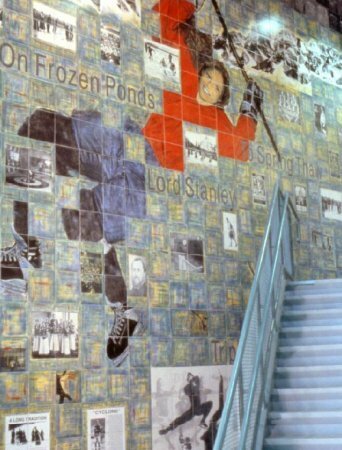 The mural’s cool greys, blues and purples suggest the colours created by natural light refracting through cold ice. 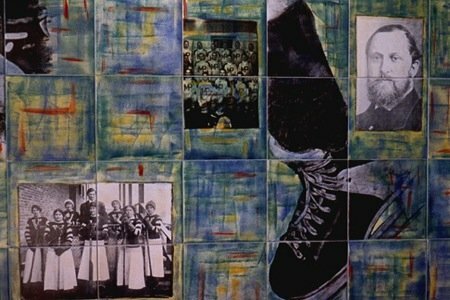 The "historical images" chosen by Williams for the project evoke professional competition, and, in the artist’s words, the “spirit, history and exhilaration of the game.” Images culled from the B.C. Archives and the City of Vancouver Archives. Images of women playing hockey emphasize the long, rich tradition of a sport often overshadowed by the male-dominated NHL; in fact, the game is now the fastest growing female sport in the country.